Drop dead gorgeous: The Lake Hoare camp is nestled beside the Canada Glacier at one end of the lake. That’s the tent where I slept in the center. 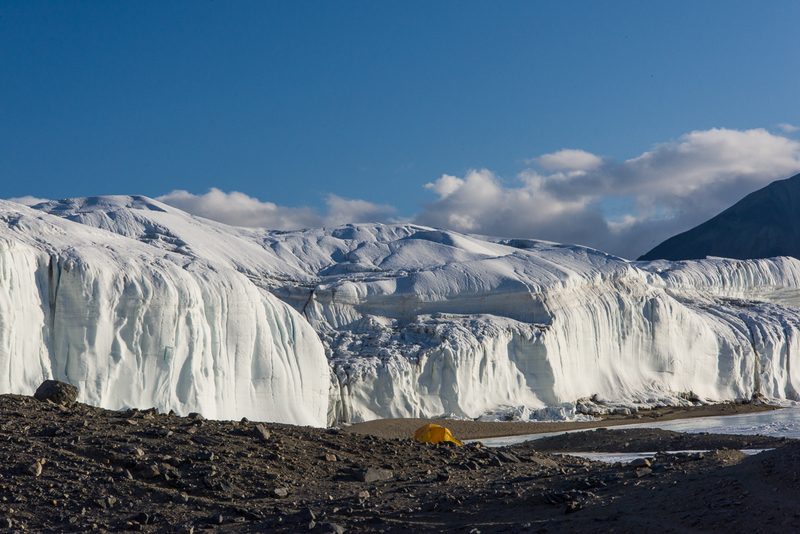 I spent Dec. 18 to Dec. 23 at what may be the most beautiful field camp site in Antarctica. Having seen a grand total of four field camps, I am admittedly not in the best position to judge the fairest of them all, and certainly they all provide fabulous scenery. But when you come out of your tent and towering over you a mere matter of yards away are the glistening white walls of the Canada Glacier with inset vertical crevices of blue ice emitting a turquoise glow, that’s hard to beat. I mean, check out that photo above. That little yellow tent in the middle is where I slept. Now look at the photo below — you crawl out of that tent turn around, and you are that close to it. White walls with glowing blue crevices — right outside the tent. View up Lake Hoare from the field camp. The main hut at Lake Hoare contains the kitchen, a long table for eating and hanging out, cubbies for keeping items you don’t want to freeze, and plenty of space to work at your laptop or the communal computer. Click this or any of these images to see enlargement. 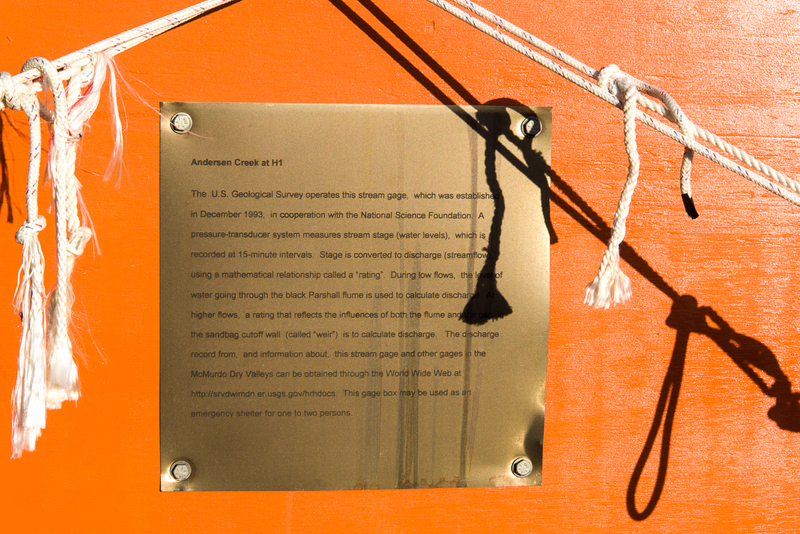 The Lake Hoare field camp is the first to have the vintage Korean-War-era Jamesway huts replaced. You’ve seen the Jamesways in my posts about New Harbor and Lake Bonney. In the near future, word is that all will be replaced with this more functional rectangular design, that allows for more wall storage, higher ceilings, and windows that you could more easily hang curtains on if you wanted to shut out the 24-hour light. 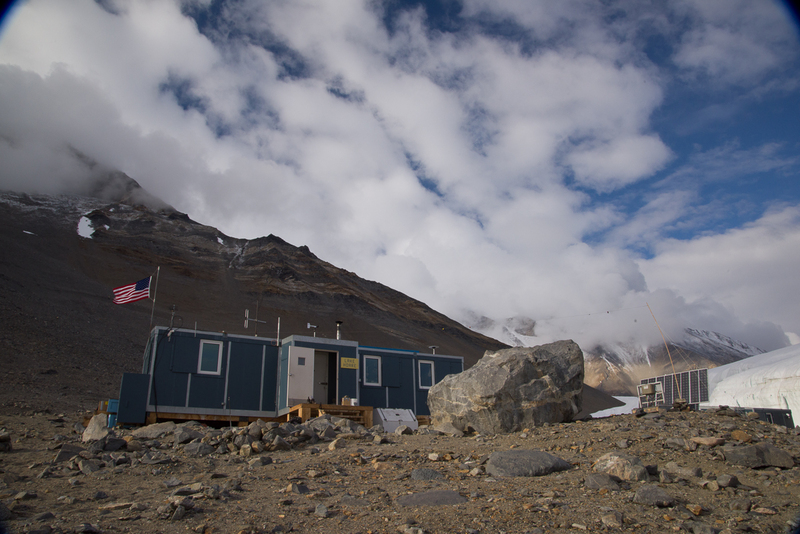 Lake Hoare is a busy camp with three small lab buildings, two “rocket toilets” (outhouses with the capability of incinerating human waste and transforming it to non-polluting ash) plus a standard Antarctic camp outhouse as a backup. The camp is presided over by Rae Spain, a 35-year US Antarctic Program veteran who coordinates the various activities of the Dry Valleys LTER camps, which include Lake Bonney and Lake Fryxell — the comings and goings of the researchers, some of whom move from camp to camp throughout the season, the helicopter supply schedules (due to the number of people working in the area there are frequent visits from helicopters, ferrying passengers, food, water, supplies and waste between McMurdo and the Dry Valleys camps as well as short hops between the camps). Rae is an imposing-looking woman, about six feet tall, who wears her hair in a thick braid that reaches to her hips. She’s organized, efficient, and a masterful cook, one night transforming the field camp ingredients into a tasty dinner of Indian curry. (And in between analyzing soil samples in the lab, Dave, one of the scientists, whipped up some naan dough, which he baked on the outdoor grill to complement the meal. That’s right!) Then there’s Renee, Rae’s assistant and all-around field camp utility player, who, when not occupied with assisting Rae at the hut or the researchers in the field, enjoys baking cookies and other desserts with an attention to detail that would impress Martha Stewart. I digress — but it’s hard not to talk about Lake Hoare without mentioning the food. 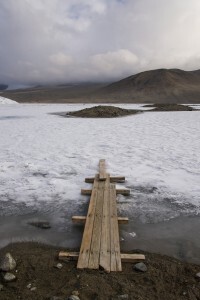 Thin ice: during the Antarctic summer sometimes you need to use the bridge to get onto the lake ice. 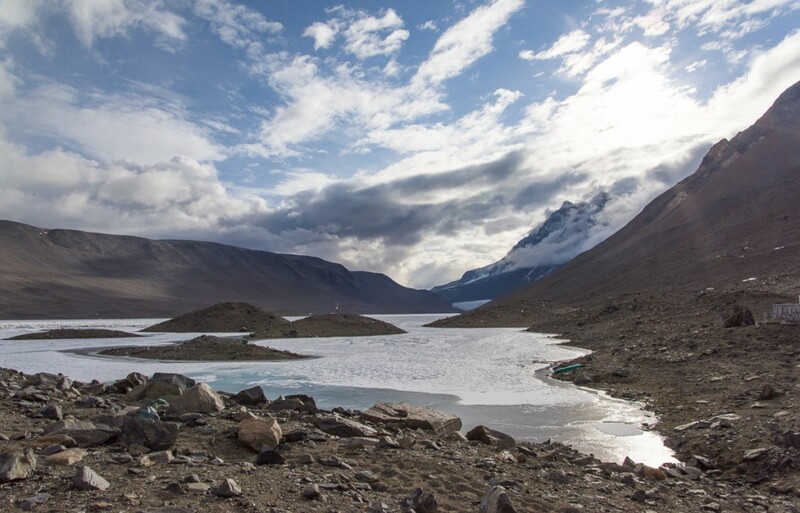 The research at the Dry Valleys LTER centers on the unusual polar dessert ecosystem, with its mostly ice-free terrain, the stationary Canada Glacier (in other words, it’s grounded and not sliding out to sea) and three perpetually frozen lakes: Lake Bonney, Lake Hoare and Lake Fryxell. (Fryxell is on the other side of the Canada Glacier from Hoare.) 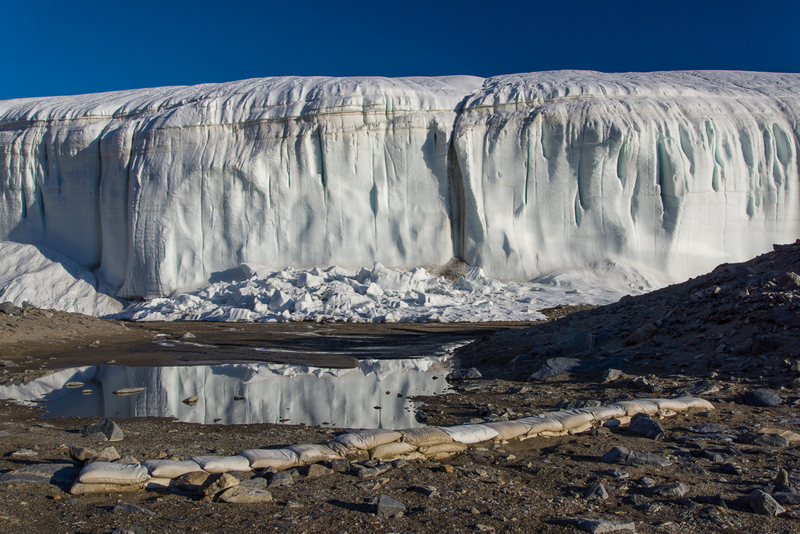 The lakes are covered with ice that is about four meters thick, in other words, about 13 feet. 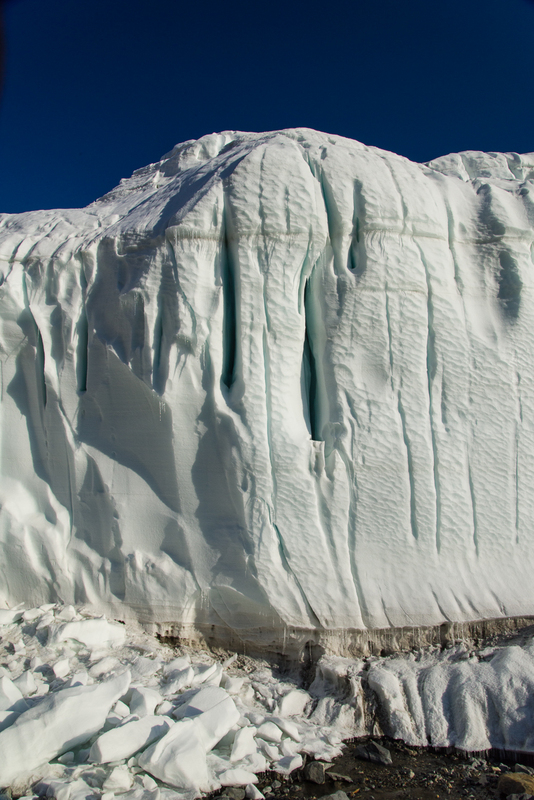 That’s just the ice — there’s deep water beneath that. Lake Hoare, for example, has an average depth of 30 feet and a maximum depth of 112 feet. 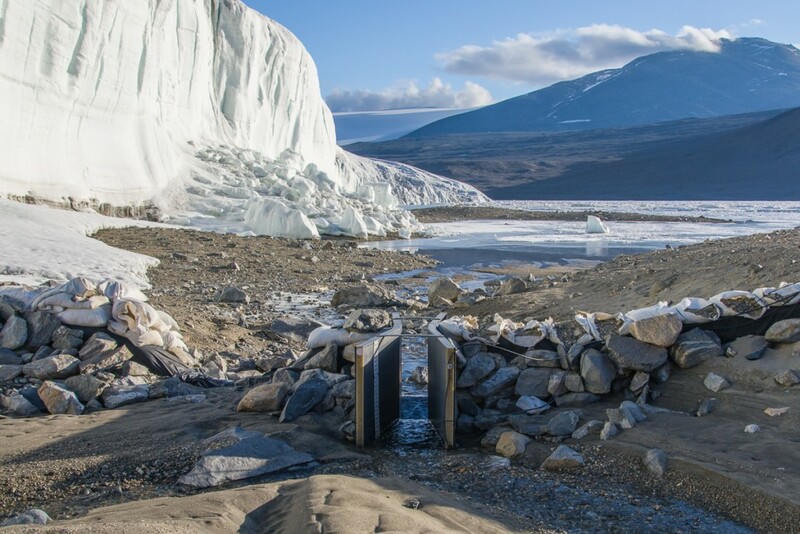 This time of year, the ice at the edges, which is over shallower water, melts in the sun, so there are makeshift bridges to get across to the thicker ice without getting your feet wet, like the one shown at left. Midnight on a clear night is a great time to photograph this side of the Canada Glacier. Anyway, late on the evening of the 21st, one by one the camp denizens closed up their laptops, finished their tea or whatever they were doing in the hut and brushed their teeth (field camp life breeds a peculiar intimacy where you floss, brush and spit out your toothpaste into a bucket in front of people you’ve known for all of three days) and went off to their tents to sleep. By about 11:45 p.m. only Dave and I were left, working at our laptops. “The light is really beautiful out there,” Dave remarked. 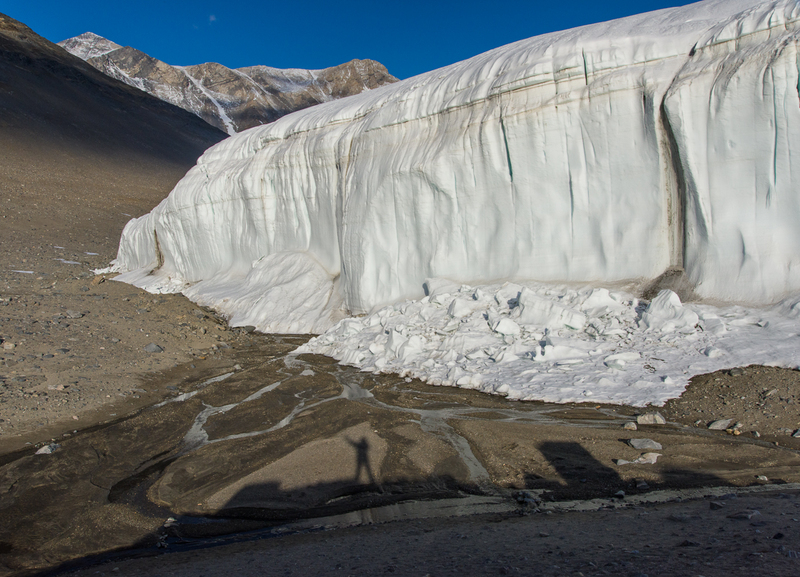 I’d been thinking that I should photograph the glacier in the evening when the light was on it, because in the morning it’s in shadow. 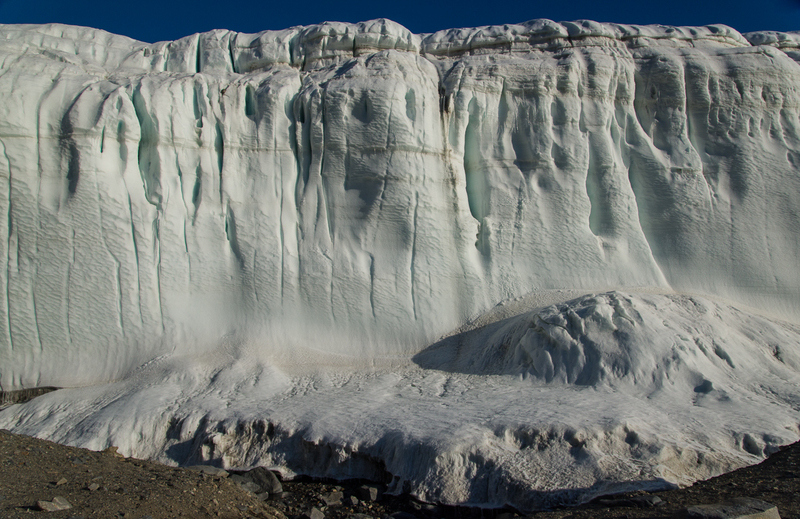 The wind was calm, it wasn’t bitter cold, and he was right, the glacier was glowing in the sun against a sapphire sky. 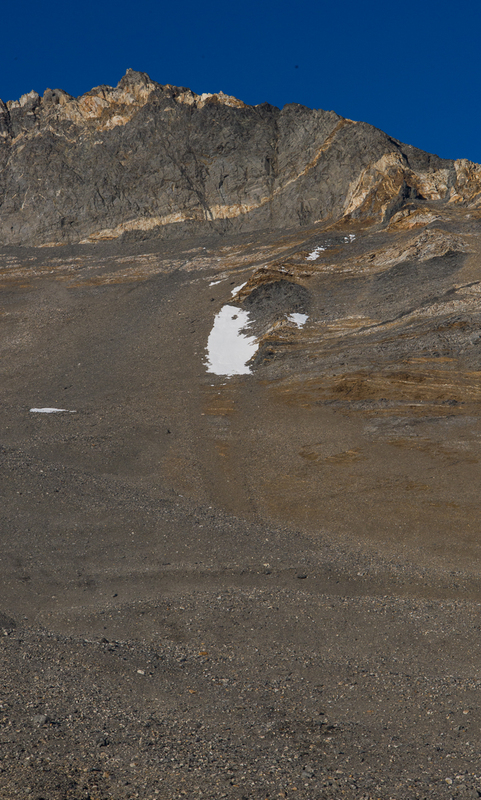 So even though I’d hiked to the Suess Glacier and back between 1 and 8:30 p.m. that day, I decided I should take advantage of the conditions and just sleep in the next day. From midnight to almost 2 a.m. I roamed around the campsite taking most of the pictures you see here. 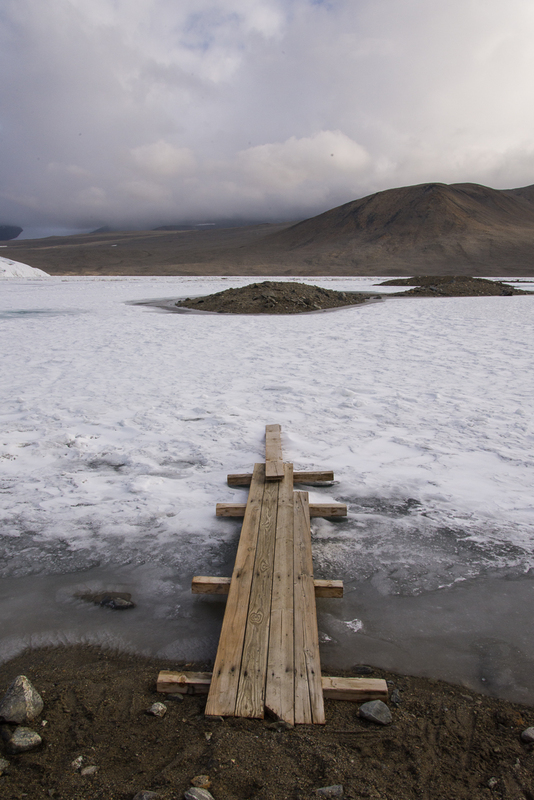 The only ones with this post that weren’t taken then are the ones above of the bridge, the hut and the view down the lake toward the Suess Glacier. 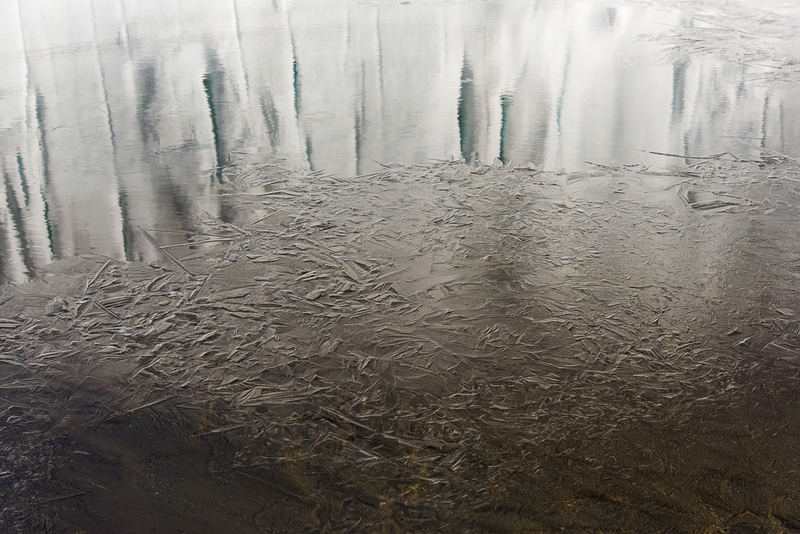 ‘Round midnight: Glacier reflected in a pool of water in the vicinity of the stream gauge. In the foreground is a row of sandbags. The stream gauge is in the lower center of the picture. This is an ice star, also known as an ice spider or ice octopus. 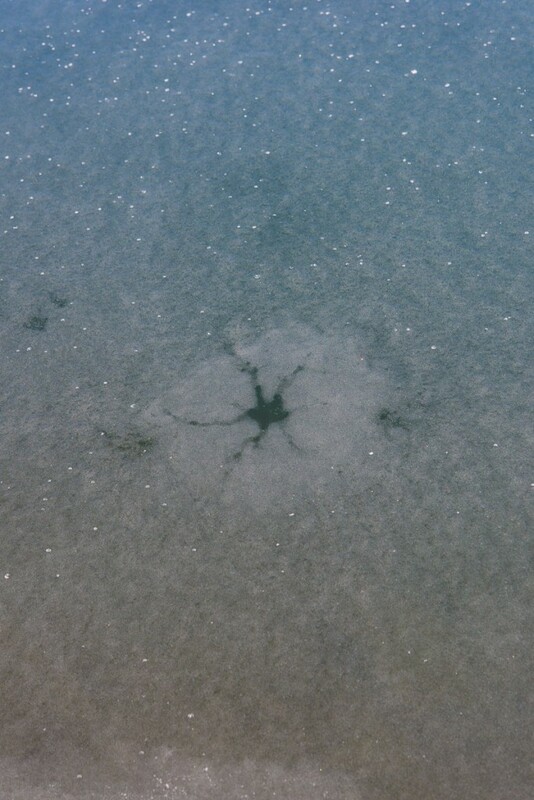 According to the lake ice web site, they are holes “associated with water flowing upwards through a hole or crack as the ice sheet is being submerged by the weight of a new snow cover.” We did have a significant snowfall a few days before. 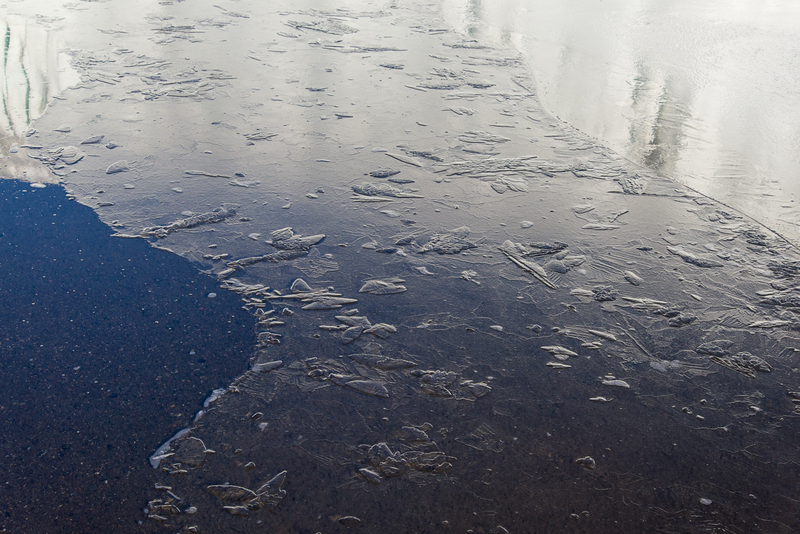 The lake ice web site says this is called “primary ice of the P1 variety” and that it forms in calm conditions moderately below freezing, which is right on target for that day. 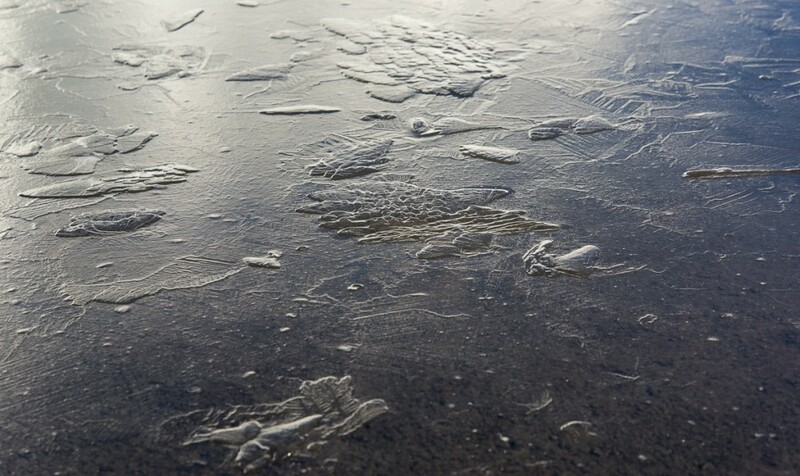 The lake ice web site goes on to explain, “P1 ice starts as needles growing across a thin, moderately supercooled layer on the surface of the water. They grow until they run into each other. After that, dendritic growth fills in the space between the needles.” In other words, the ice crystals keep branching until they touch other crystals. But it looks like they also grow vertically as well as laterally. 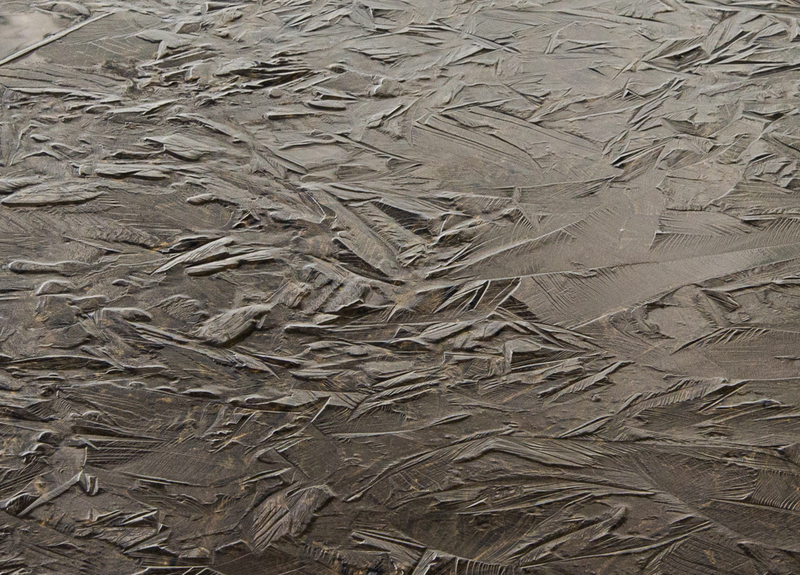 A detail of the above photo so you can get a sense of the complexity and variety of the ice surface. 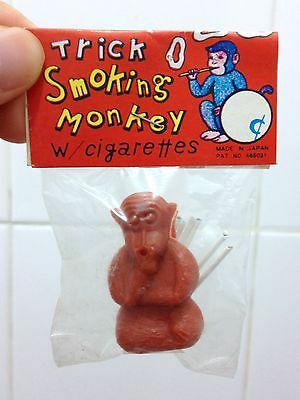 Reminds me of Asian ceramics. 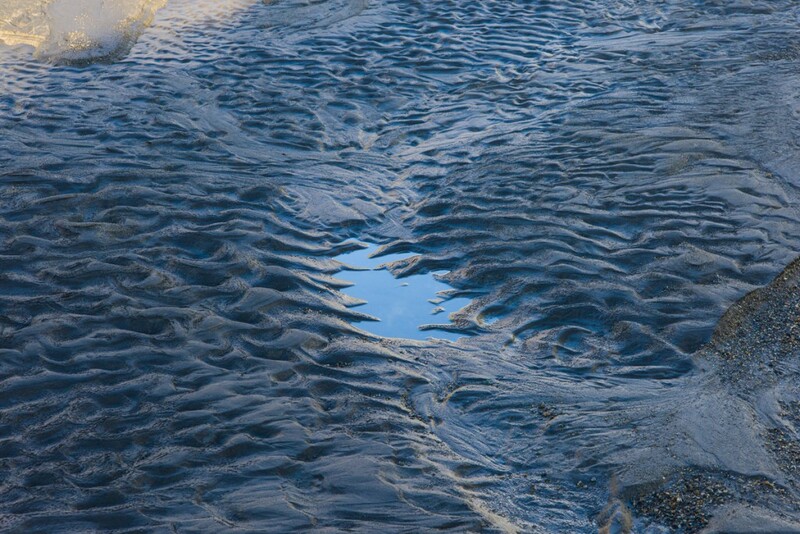 A puddle in the stream bed reflects the bright blue morning sky — 1:30 in the morning that is. This patch of snow was a Rorschach blot that brought back a repressed memory from my childhood. Glacier with the shadows the stream gauge box and me.